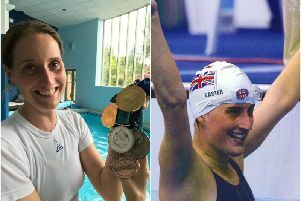 A KENILWORTH sportswoman who has competed on the world stage is backing the decision to include athletes with learning disabilities in the Paralympics. Dimensions, a social care provider which supports 2,500 people who have autism and learning disabilities in England and Wales, has welcomed the end of the exclusion which came into force when the Spanish basketball team were disqualified from the Paralympics in Sydney in 2000. Katie Smith, who is supported by Dimensions, competed in the kayaking event at the Special Olympics in China - an event created to include people with learning disabilities after the decision was made to exclude them from the Paralympics. The 30-year-old said: “It is a special journey to be able to take part in a huge sporting event, I really enjoyed taking part in the Special Olympics. Dimensions has recently launched a charter in Parliament, which calls for people with autism and learning disabilities to be included more in their community. One of the pledges states ‘I want to be part of my community’. The not-for-profit organisation is a champion of personalisation and believes in giving people the opportunity to choose the life they want to lead. Rashmi Becker, an executive director at Dimensions, said: “It is essential for people with autism and learning disabilities to be included in their community. “The fact that athletes with learning disabilities can now get involved again in the Paralympics signals a move in a positive direction in terms of inclusion. “It means that their abilities will be rightfully recognised in front of a global audience and I think that is inspiring and exciting. “It should be celebrated that people are once again being recognised for their achievements – people with learning disabilities have just as much right to compete as those with a physical disability. It is essential that the dreams of people with learning disabilities and autism are not sidelined. “The fact that athletes with learning disabilities will once again will be able to compete in the Paralympics allows them choice as to how they want to progress their competitive career.